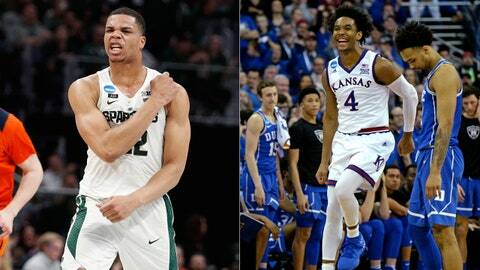 The Hornets added Michigan State's Miles Bridges (left), the 12th pick, and 34th pick Devonte’ Graham of Kansas, on draft night. CHARLOTTE — FOX Sports Southeast will deliver live coverage of the Charlotte Hornets press conference introducing the team’s 2018 NBA draft selections today at 11:00 a.m. ET. Local channel listings can be found here. The press conference will also be available on FOX Sports GO, an app that provides live streaming video of FOX Sports content through programming distributers. FOX Sports Southeast, exclusive regional home of the Charlotte Hornets, will televise all locally available games during the 2018-19 NBA season to more than 3.3 million households throughout North Carolina and South Carolina. The FOX Sports regional networks serving the Southeast – FOX Sports South, FOX Sports Carolinas, FOX Sports Tennessee and FOX Sports Southeast – collectively reach more than 11 million households across seven states. They are the television home of the Atlanta Braves, Atlanta Dream, Atlanta Hawks, Atlanta United, Carolina Hurricanes, Charlotte Hornets, Memphis Grizzlies, Nashville Predators, Cincinnati Reds, Indiana Pacers, New Orleans Pelicans, St. Louis Cardinals, Bundesliga, Atlantic Coast Conference, Big 12 Conference and Big East Conference. Combined, the networks televise nearly 1,400 live events each year. Hornets Sports & Entertainment owns the Charlotte Hornets and Greensboro Swarm and operates Charlotte’s Spectrum Center. The Charlotte Hornets are a member of the NBA’s Southeast Division. Owned by NBA Legend Michael Jordan, the Hornets organization strives to deliver a relentless attack on the court, an unmatched experience in the stands and a positive impact throughout the community. The name of the city’s original NBA team from 1988-2002, the Hornets moniker returned to Charlotte in May 2014, uniting the rich history of NBA basketball in the Carolinas. The Greensboro Swarm are the NBA G League affiliate of the Charlotte Hornets and recently completed their second season at the Fieldhouse at the Greensboro Coliseum Complex. Spectrum Center is the premier destination for sports and entertainment in the Carolinas, hosting over 150 sporting events, concerts and family shows annually. For more information, please visit hornets.com, gsoswarm.com or spectrumcentercharlotte.com.